Hudson Falls Village Hall is located at 220 Main Street, Hudson Falls NY 12830; phone: 518-747-5426. 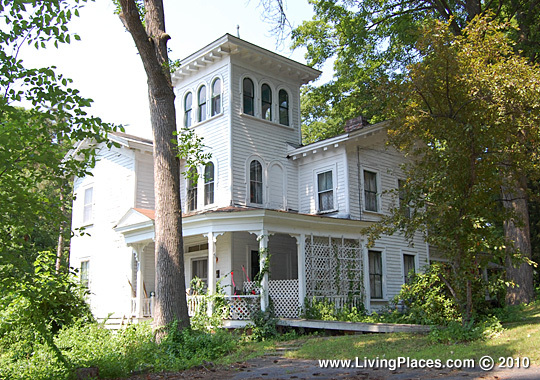 See: Hudson Falls Historic District. The earliest white settlement of the present Hudson Falls/Kingsbury area occurred in 1768. Strategically located astride the vital north/south travel route between the Hudson River and Lake Champlain, this area was fiercely contested during the French and Indian War and the American Revolution. Not until the last threat of military invasion ended in 1784 was the first permanent community established as Sandy Hill. In 1806 the first courthouse for Washington County was established there, encouraging lawyers to settle in the burgeoning village. Beginning in 1813, log drives from the Adirondack mountains brought vast quantities of timber down the Hudson River to the sawmills established below Sandy Hill at Baker's Falls. Transportation improvements such as the Waterford-Whitehall Turnpike (1806) and the Glens Falls Feeder to the nearby Champlain Canal (1832) stimulated local commerce and industry. With the advent of pulpwood paper making technology in the post-Civil War decade, an industrial boom and a corresponding residential construction boom transformed both the appearance and the economy of the village. Hudson Falls remained an important paper mill town until the mid-twentieth century, when less expensive labor and pulp sources in the south brought on a prolonged period of local decline in the paper industry. Smith, Raymond W., NY State Division for Historic Preservation, Hudson Falls Historic District, Washington County NY, nomination document, 1983, National Park Service, National Register of Historic Places, Washington DC.